Besides bursting with color, Eureka Springs is full of October fun. 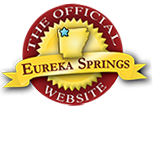 Here are some of the most popular things to do in Eureka Springs this fall! Take photos of the fall leaves in some of the most scenic places in the Ozarks. Eureka Springs is a perfect spot for Ozarks fall foliage in the end of October. What better way to see the changing treetops than to zip through the air? Enjoy views of the fall color from the canopy with Ozarks Mountain Ziplines. 2.) Eagles on Beaver Lake. Eagle Watch begins in October on Beaver Lake. The best way to see them is on the 12-mile Belle of the Ozarks cruise on Beaver Lake. Daily departures May thru October at 11am, 1pm & 3pm (Closed Thursdays). 3.) Tour America’s Most Haunted Hotel! Gain exclusive access to some of the most famous ghost sighting locations in America. Ghost Tours at the Crescent Hotel are a must for any Eureka Springs visitor. Spend the night in America’s Most Haunted Hotel on Halloween: Don’t miss the Paranormal Pair 2 Night Special! Come to Intrigue Theater – and experience an evening of Mystery and Intrigue with Sean-Paul the Illusionist and Juliana Fay as the Medium, Featuring Special Guests from the other side. Take a Seat – but only use the edge of it. Voices from the Silent City on this guided tour of Eureka Springs history. The Eureka Springs Historical Museum. Cemetery walking tours on Thursday, Friday and Saturday, October 20th, 21st, and 22nd. Then again on Friday and Saturday, October 29th and 30th. The living history tours feature live actors in period costumes portraying early citizens of Eureka Springs. This entry was posted on October 5, 2016 by service424 in Attractions, Crescent Hotel, Fun Downtown, Ghosts, History, Lodging Specials, The Great Outdoors, Things to Do and tagged Arkansas, beaver lake, Belle of the Ozarks, Cemetary, Eureka Springs, Eureka Springs Arkansas, Fall Foliage, halloween, haunted, intrigue, Ozark.